1. To begin with, don’t worry about the housework. Seriously, the house isn’t going to fall down around your ears if you don’t hoover the floor for 24 hours, neither is anyone going to look down on you if your house isn’t spick and span. You are sick, they are not. If they were any sort of decent person, they would be offering you any help they can, not judge you. 2. Don’t worry about what the kids are eating. Obviously if you all have tummy bugs, then food is going to be the furthest thing from your mind, if you eat much at all it is likely to be in the form of dry snack foods, like crackers, or toast. But if you have another type of illness you don’t need to stress. Even if you all live on beans on toast, take outs, tinned fruit or frozen pizza for a few days whatever is easiest for you all is just fine. You can go back to the organic, cooked from scratch, non processed foods when you are better (only if that’s your thing of course). 3. Drink plenty. I know this one isn’t rocket science and everyone says it, but that’s because it’s true! It doesn’t even have to be water. The best way to get rid of bugs is to keep hydrated, it can help flush them through your system much quicker than if you drink very little. Don’t worry about what you or your children are drinking, whether it be pop, fruit juice, tea or water. As long as it is getting fluids into your system anything you fancy is just fine. 5. 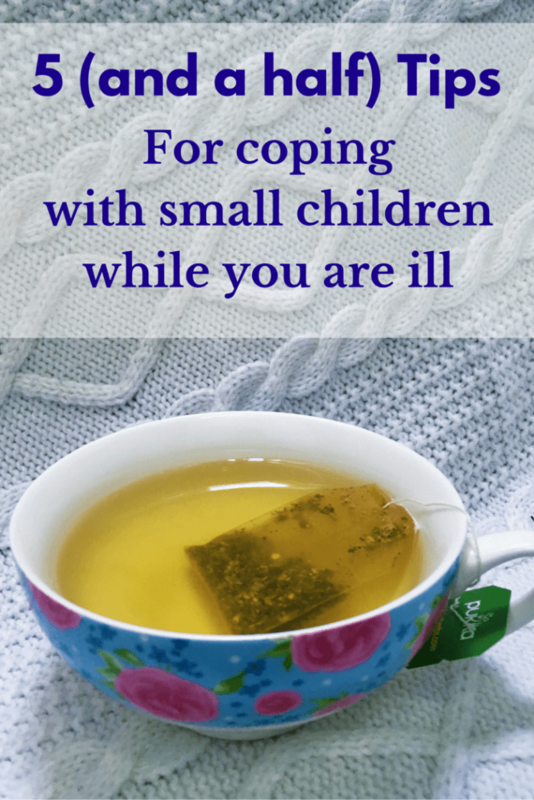 Take any offers of childcare, or even ask someone if you are really poorly. Family and friends are bound to be happy to occupy small children for a few hours, even if they come to your house so you can go to bed for an hour or two. 5.5. Enlist your teenagers (or older children) to help. Now obviously this one requires a bit of forward planning, and bringing random teenagers into your home is frowned upon, but if you do have one of the ‘hormonal ones’ sharing your home do make use of them. Getting them to fetch and carry, make a simple meal or a cuppa and keep the little ones out from under your feet for a couple of days isn’t going to kill them. It may be wise forewarn them of what’s expected of them when you first feel like you’re coming down with something just so you can deal with the inevitable moans and complaints while your still mentally well! How do you make your life easier while you are sick? Do you have any other tricks or tips to share? Great set of tips Katie, older ones would definitely be handy for me sometimes! Yup, sleep usually is the best cure for anything! Ooops – I meant #sundaystars!! !